← You can’t wear your sensible hat all the time. Hail, Hail The Celts Are Here..
For unbelievably selfish reasons I whooped with joy when I watched the Champions League draw and saw that Celtic were paired with Barcelona. A similar reaction, I imagine, to that of the Christians when they were drawn against the lions. First up, where to stay.The first thing you need to ask yourself is, realistically, how much time am I going to spend in my accommodation? For the vast majority I’m guessing, very little. It will merely be a place to wash and sleep so a four or five star hotel is almost certainly a waste of food and drink money. Something at budget end or a hostel is probably your best bet. They always appear to have a huge selection of hotels, apartments and hostels at decent prices. As to where to stay again be realistic what you are likely to do during your trip. If you are going to be pished out yer gourd for the entire duration of your trip and looking for a sing song then somewhere in Barrio Gotico i.e. the centre fits the bill. If you are of an age where a good session floors you for 3 days, like me, then you may be best looking a little further out. Eixample and Pl Espanya will be a little less “full on” and are well served with bars and restaurants to keep you amused. Booking.com has a great advanced search facility so you can narrow down your requirements pretty easily. Those of you familiar with my work will know I’m going to kick off with food. If you look through some of the previous posts you’ll get plenty of ideas and recommendations but there are two that I must bring to your attention. First up is the best value for money place in the city, La Malandrina in Barceloneta, a steak restaurant. The Vacio for 7.50€, served with creamy spuds is simply sensational. The only problem is that it is shut on a Monday but if you are here for a few days and are down the beach area then don’t miss it. If you are in and around the Pl Espanya area there is a pizza restaurant La Pizza Loca. I reckon it’s the best in the city and very good value for money. The experience is helped by the presence of Fabio, a wee dude who spend some time in Glasgow and loves “the banter”. Having someone who speaks Glaswegian around definitely adds something to the place. Now we move swiftly on to the “Salvador Dali”.If you spend your time in the centre than expect to pay around 3€ for a bottle of Estrella, a pint will set you back around 5€ and it’s 7/8 euro for a spirit and mixer. Away from the central areas you won’t walk far before coming across bars, normally Chinese owned, that sell San Miguel for a euro a bottle and a spirit and mixer is nearer the 4€ mark. With regards to spirits remember that they are VERY generous with the measures. Each drink has probably 3 or 4 UK measures in it, so drink responsibly kids. One note of caution, these euro bars are normally in more residential areas and noise pollution is taken very seriously. Having a sing song won’t be appreciated, the locals will call the police and the bar owner can be fined so, show some consideration, they have been plying you with cheap drink so play nice. If you want to get noisy then the Irish bars in the centre will let you sing away to your heart’s content. I’ll update this section as the game approaches but on basis of previous draws against UK opposition it is likely they will disable the option to buy tickets online and through certain cash machines and the ticket office won’t sell to anyone with a UK or Irish passport. You can get round this if you get a taxi driver for example who speaks English, bunging him a tenner or so,plus a fare up and down to the stadium will get the job done. You shouldn’t struggle as the locals really don’t get “into” the CL till the quarter final stage. I’ll be updating the blog over the coming weeks so If you have anything you want me to cover then leave a comment and I’ll see what I can do. This entry was posted in Accomodation, Cheap food, Don't be a wee fanny, Drinking, Football, Pl. Espanya, Tapas. Bookmark the permalink. 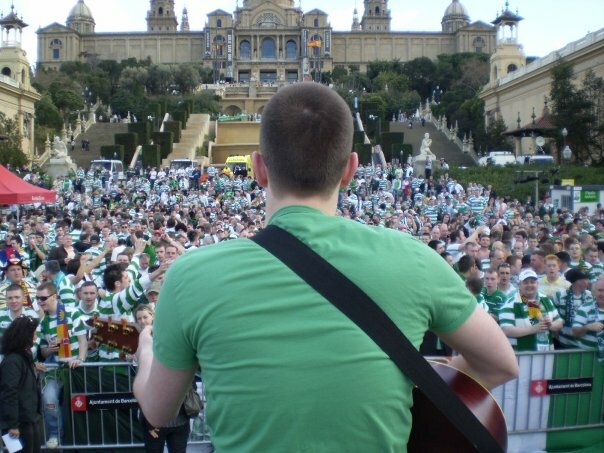 1 Response to Hail, Hail The Celts Are Here..